Use 7 cracker sandwiches for each caterpillar, spread one side of 6 cracker sandwiches with peanut butter. Press uncoated side of 1 cracker sandwich to peanut butter-coated side of another cracker sandwich. Repeat with remaining 5 cracker sandwiches, offsetting slightly to form S-shaped caterpillar and ending with 1 uncoated cracker sandwich. Arrange caterpillars on serving plate. 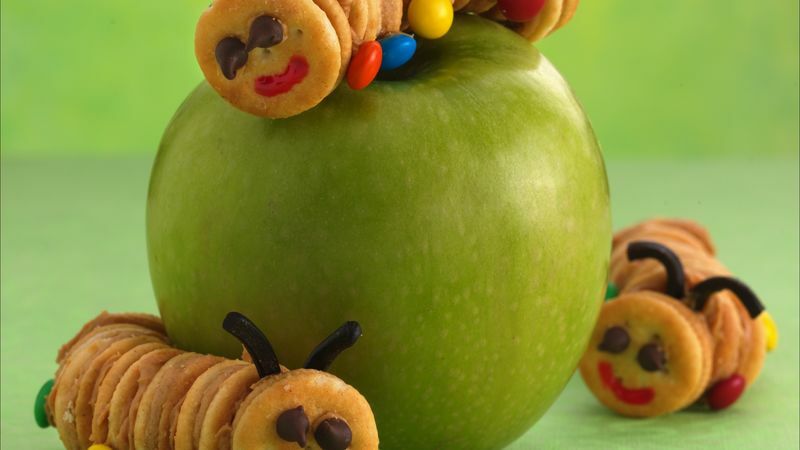 On each caterpillar, attach 2 chocolate chips with small amount of peanut butter on one end for eyes. Place 2 pieces of licorice between first 2 crackers for antennae. Attach 4 baking bits with peanut butter along each side of caterpillar for legs. With decorating gel, decorate "face" with mouth and any other features. Just for fun, create a "play ground" on the serving plate for your caterpillars. Smash up some chocolate wafer cookies to make "dirt," and color some coconut green for "grass."